SONY MUSIC/Provident Label Group are releasing the first single "Turn My Eyes" by a group of four siblings, Bonray. 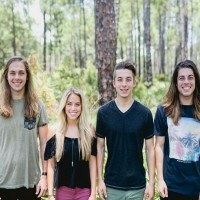 The group, consisting of Zac, Jesse, Jake and Morgan Bonner from Pennsylvania, have since 2014 been touring around the US while also blogging and creating popular mashup/cover songs for YouTube from artists such as Needtobreathe, TobyMac, Danny Gokey and Justin Timberlake. "Turn My Eyes" was produced by Bryan Fowler (TobyMac, Mandisa) and co-written with the band by Fowler and Jonathan Smith (Zach Williams, We Are Messengers).